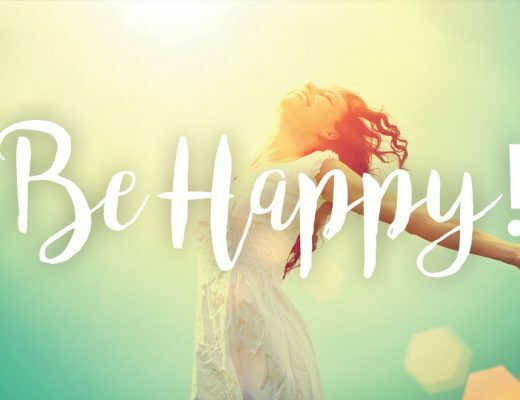 I know, I know I’ve been very slack on the ole posting front lately – my apologies, the day job has had me busy, busy, busy, and you know what I’ve been loving every minute of it. So much so that I wanted to tell you all about my latest project. Sabrina Hill, known to a lot of you on social media as @superstylesabby on instagram, has taken the term #GirlBoss or actually #Boss to a whole new level. Have a look at the story below and you’ll see exactly why. 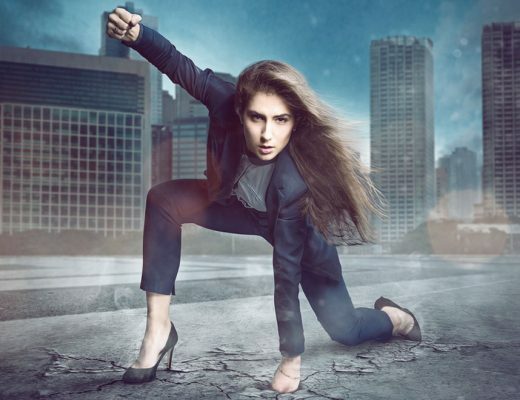 I am proud of her and proud to know her – she is some woman for one woman! 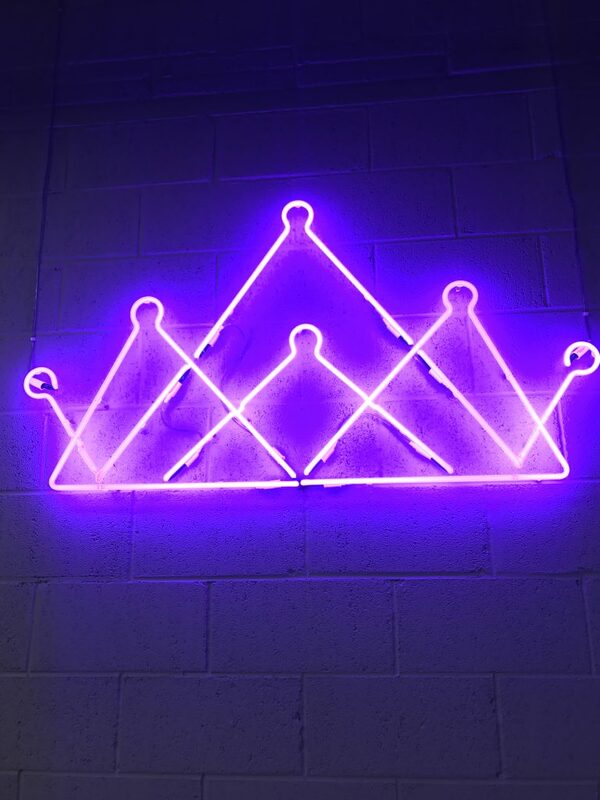 Oh and yeah, I thought my office was nice but I’m definitely thinking of relocating our 19 staff from HC HQ over to Kopper City !! In today’s digital world, the days of mood boards for your dream interior design project are almost extinct what with the likes of Instagram, Pinterest and the multiple other visual social networking platforms. 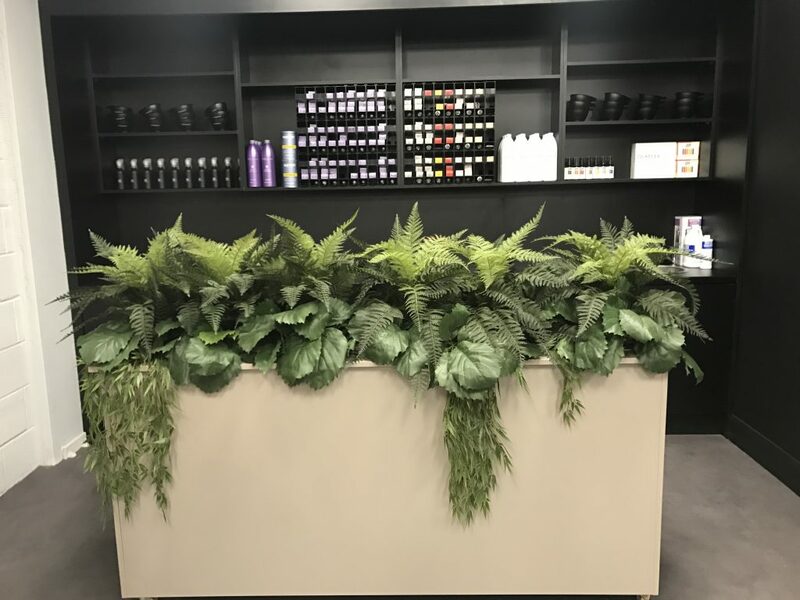 With that, yesterday an insta-story came to life with the opening of Cork’s largest hair and beauty salon Kopper City at Unit 3 Half Moon Street. Creating almost thirty jobs in the city, twenty-two on opening and an additional six by the end of 2018, the premises not only oozes style and sophistication but a fun and formidable design vision from its owner Sabrina Hill. 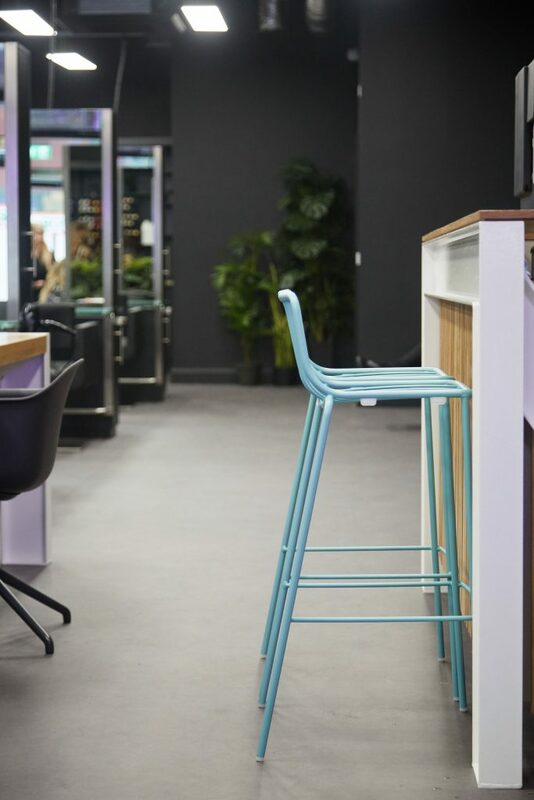 With sixteen styling stations, five reclining massage basins and a large colour bar, the three-thousand five-hundred square foot salon Kopper City is the largest hair salon in Cork with over twenty-seven hair colourists, stylists and salon staff. 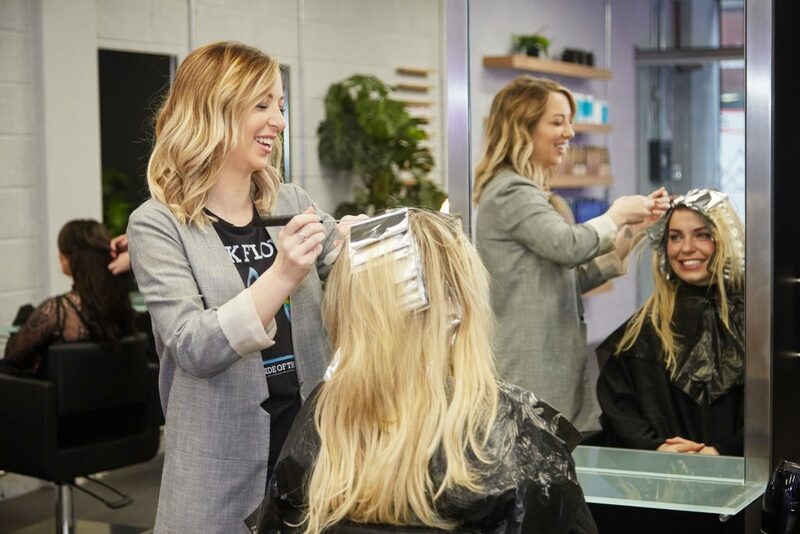 Kopper City’s staff include colour technicians, stylists and managers with qualifications in master colour degrees who regularly train throughout Europe and Ireland. 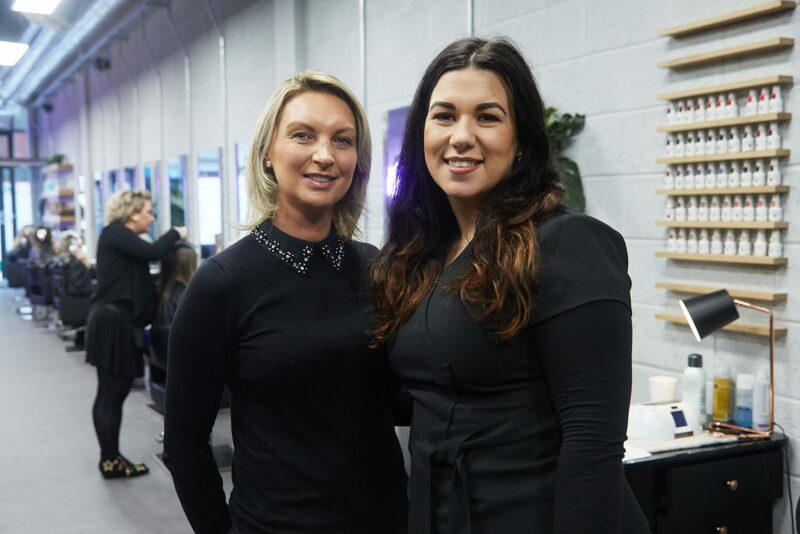 This is the second of the Kopper Hair Salon family, owned by Sabrina Hill where its sister salon has had its home in Glanmire for the last twelve years employing five people. 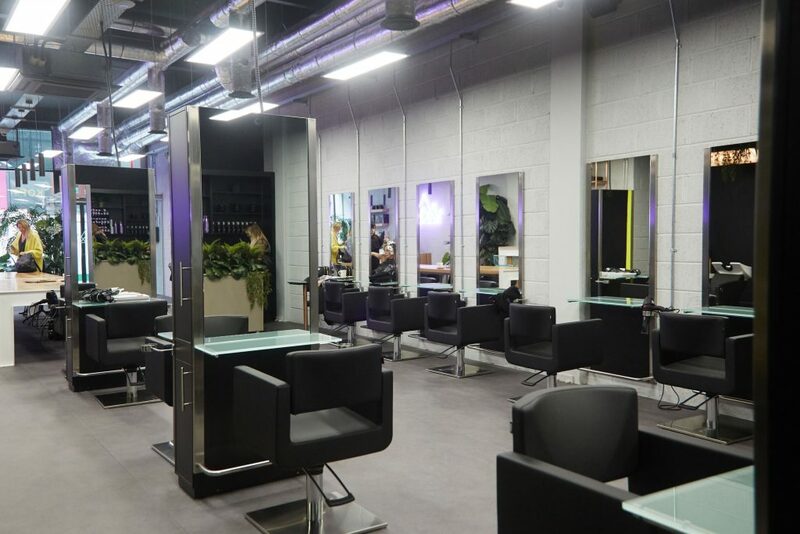 The Glanmire salon recently went through a design revamp and staff recruitment drive creating a further two additional jobs. 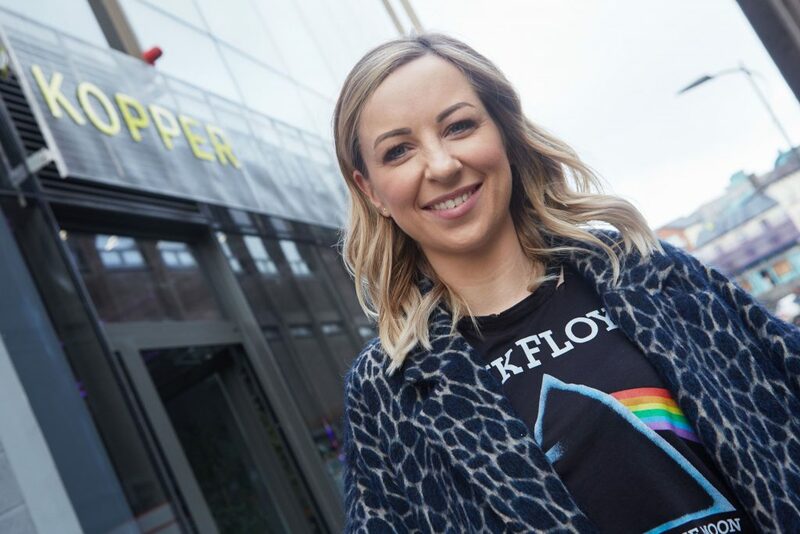 Kopper’s clientele already include many Irish celebrities and influencers but Sabrina knows that the people who were there when she opened her doors in Glanmire on day one are just as important. To further assure her long-standing clientele, Sabrina invited them all in to Kopper City on the opening day yesterday for free blow-drys and a first glance at her new salon to show her appreciation. 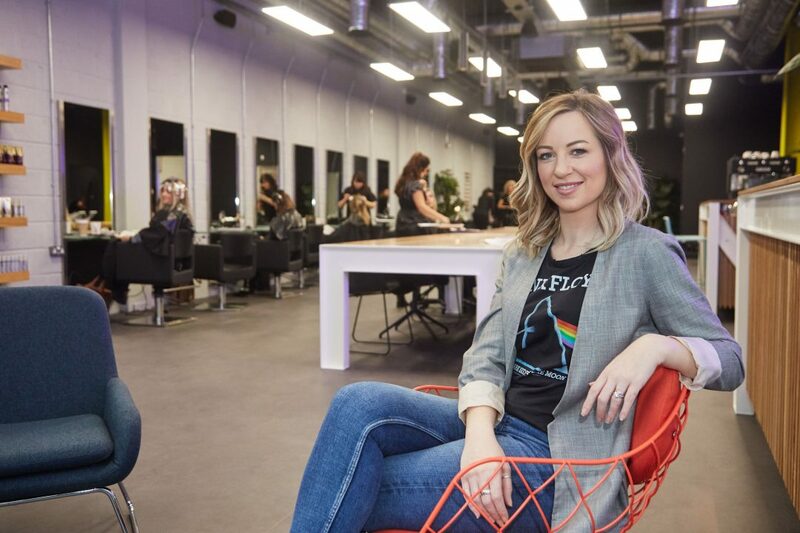 Not only does the salon facilitate the hair needs of the client, it is also host to Beautique beauty salon, headed up by Cliona Sweeney, a long-standing colleague of Sabrina’s. 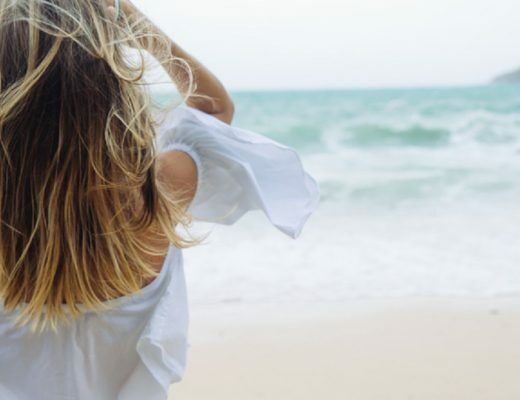 The beauty offering includes two nail bars and four treatment rooms, while creating two new jobs to provide tanning, waxing, eyelash extensions, facials and eyebrow treatments. 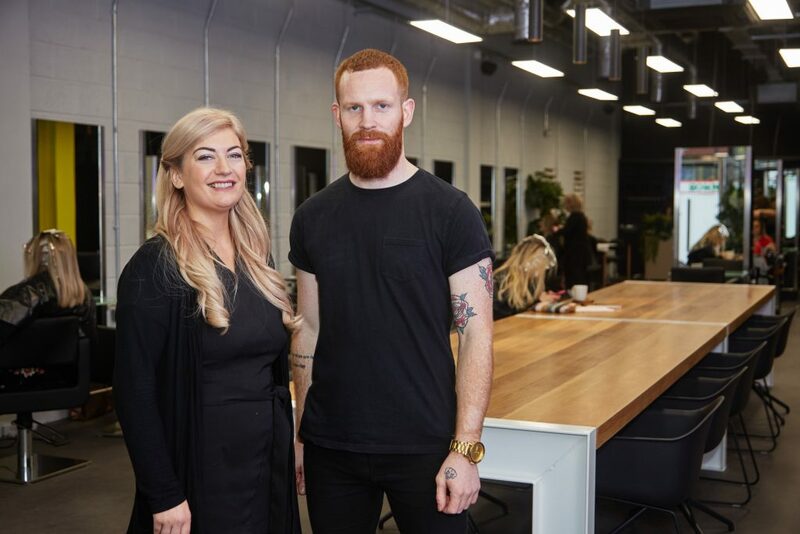 Pictured left to right are Cliona Sweeney, Owner of Beautique Beauty located at Kopper City and Neil O’Connell Stylist at Kopper City. Kopper City however, is not just an ordinary salon, to passers-by on the street, it may look like a sophisticated hangout or coffee club and that’s exactly what Sabrina wanted to achieve. 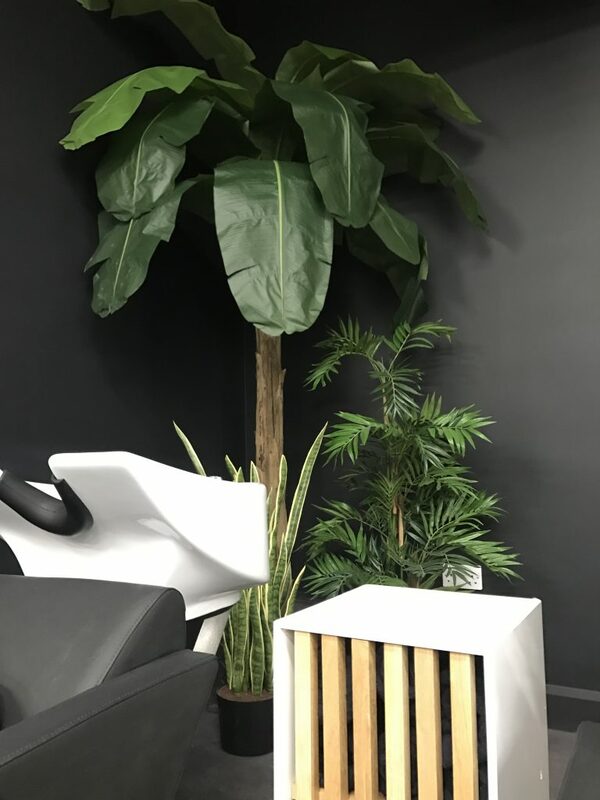 The waiting area in front of the floor to ceiling windows at the shopfront of the salon has a melange of seating in varied colours, materials, shapes and sizes, and is surrounded by a cluster of tropical trees and plants. 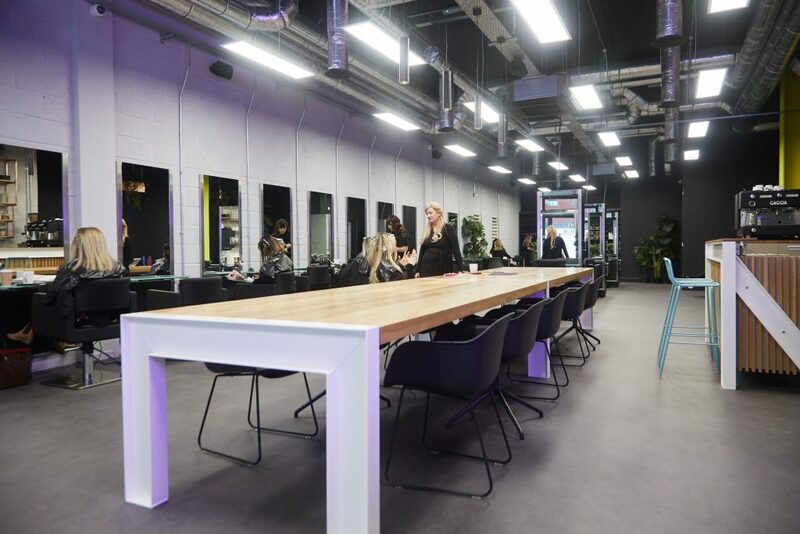 Clients can also take a seat at the six metre-long solid-oak table to have a chat and get some work done or while waiting their turn to get their crowning glory seen to. 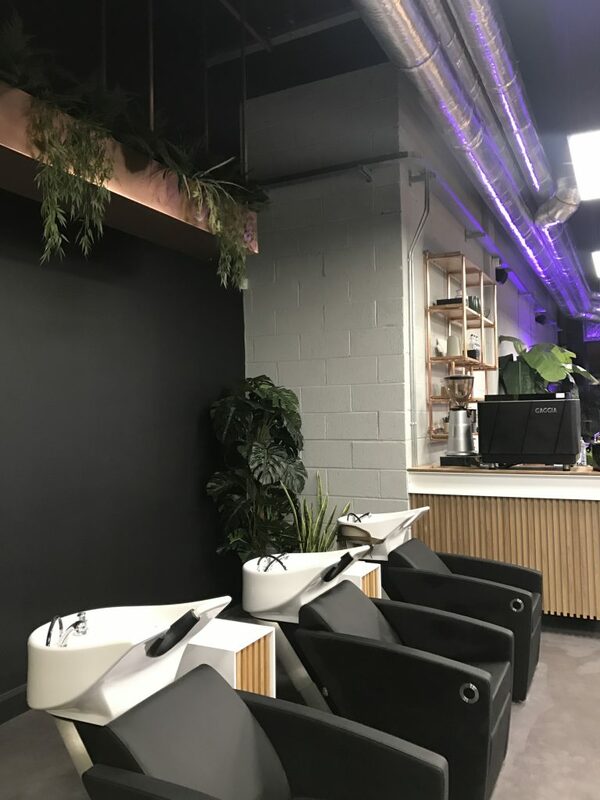 Furthermore, this bespoke table is an additional location for clients to relax while getting their hair styled or during the down time for their colour corrections before they return to the sinks with the reclining massage chairs. 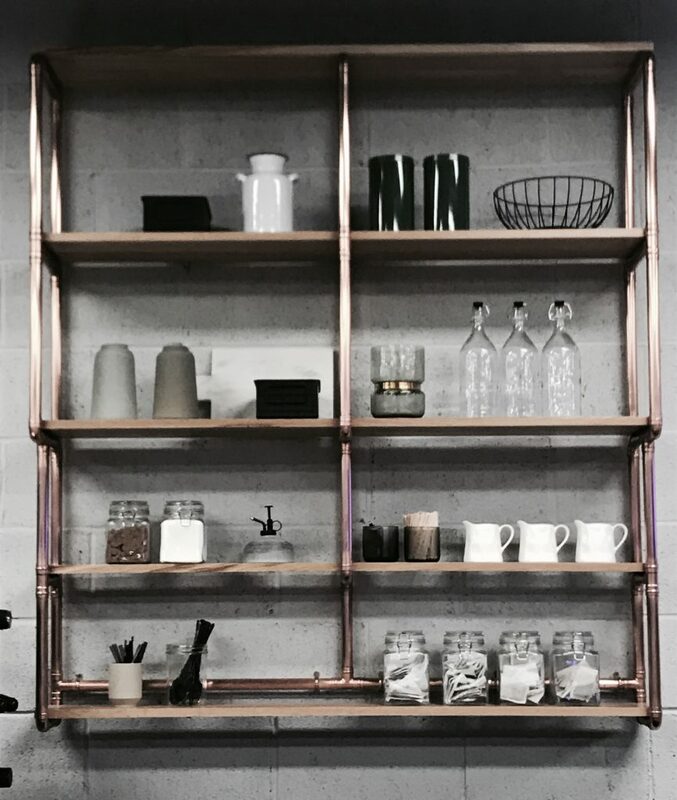 The salon boasts a fully stocked coffee and tea bar next to these areas adding that little extra for clients or those just popping in for a chat or to purchase products from their two retail areas stocking Moroccan Oil, Joico, Alfaparf Milano, Tangle Teezer and many other products. 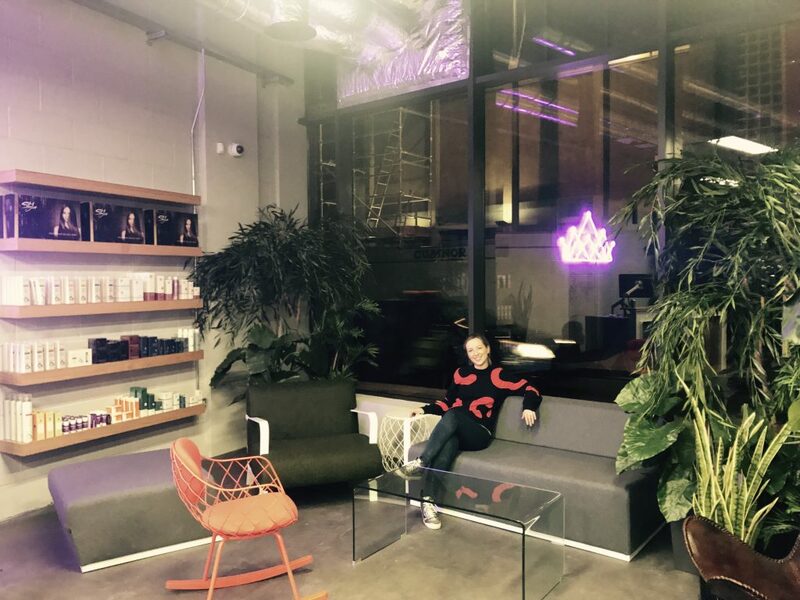 The interior design was not only the brain-child of Sabrina but she enlisted the expertise of interior designer Cathy Flamingo whose portfolio includes impressive designs such as the Weddingdates.ie office and The Brow Factory. 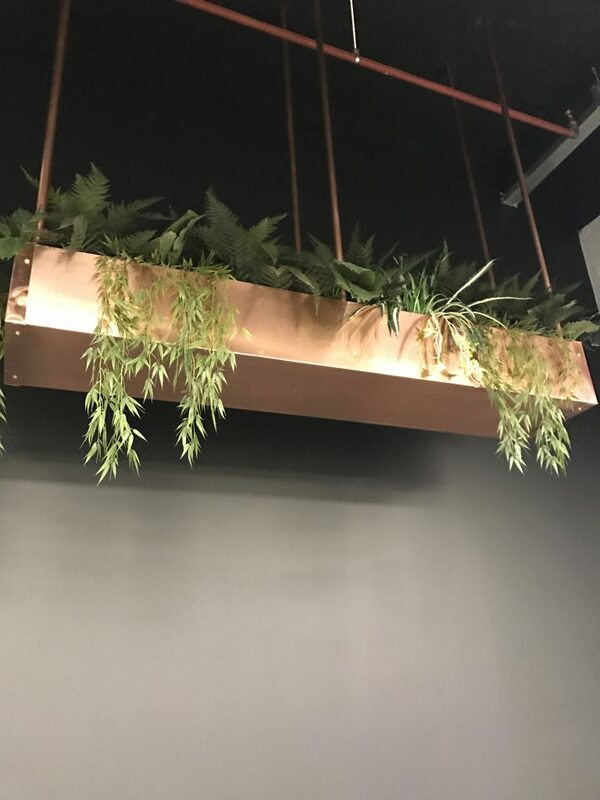 Design talking points throughout the salon include accents of neon, wood and copper with an abundance of greenery, copper planters, craft carpentry, and varied styles of lighting. 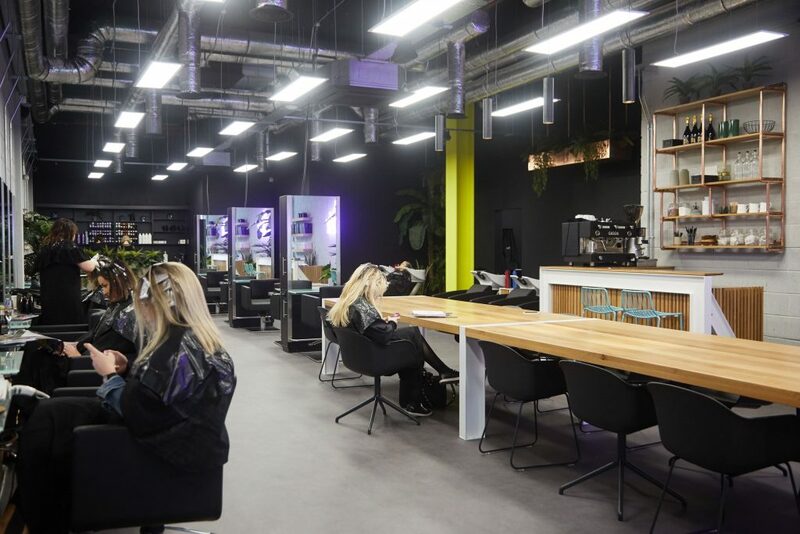 “I really wanted to create a space that was not just a salon but somewhere for our clients to come and feel relaxed, and not in a rush to get from A to B, it is a social space with lots of talking points throughout the interior design. Cathy Flamingo and Mike Daly of MJ O’Doherty Building Ltd. really helped me bring my vision to life to achieve this inclusive and interactive environment for both our clients and our team here at Kopper City. 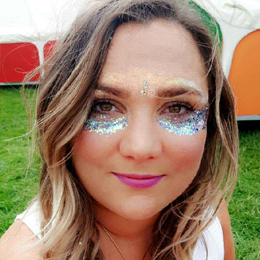 I cannot thank them enough and I look forward to welcoming clients old and new into our Half Moon Street Salon”, she concluded. Kopper City is open five days a week, Tuesday, Wednesday and Friday from 9am to 6pm, Thursday from 10am to 8pm and Saturday from 9am to 5pm. 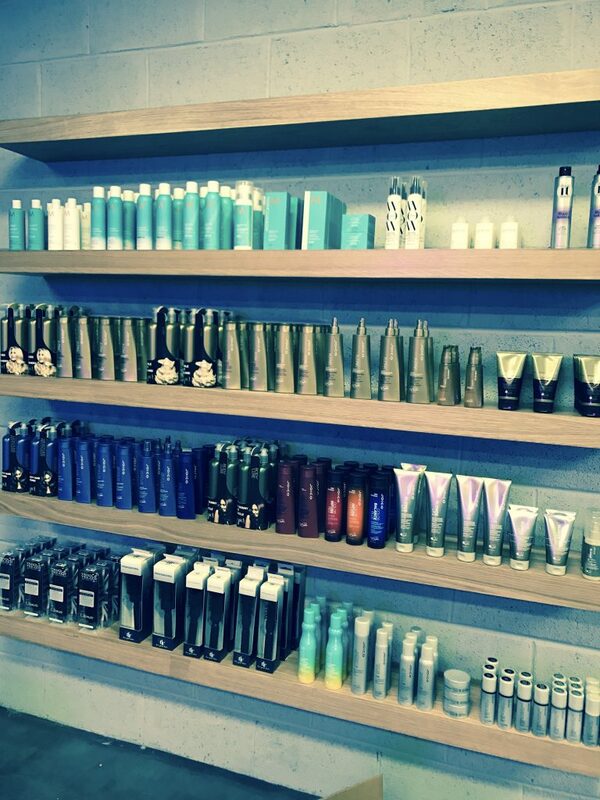 To make an appointment call 021-4820692 or email info@kopperhairsalon.ie. For more information find Kopper Hair Salon or Sabrina Hill (@superstylesabby) on Facebook, Twitter, Instagram and Snapchat.